I’ve written recently about my efforts to incorporate bullet journaling into my note-taking system. You can read about this here and here. As I mentioned in my second post, I am finding the paper notebook fun, handy and effective, more so than I expected. Many notes can live inside the notebook, without being transferred to other media; however, I still see the need to move notes (or take them in the first place) in an app, either on my iPad Mini or my new 11″ MacBook Air. Before going forward, a note about this latter device. I picked up the Air last month because I was unhappy with the portability of my 13″ MacBook Pro and my ability to take detailed notes on my Mini. The Air isn’t much larger than a regular-sized iPad, especially if you factor in the need to have a portable keyboard. Yet I can take it almost anywhere. It seems to me the perfect companion to my bullet journal notebook. And, the best thing about it, the Air allows me to have access to one of my favorite apps, Tinderbox. And that gets me into the real subject of this post, using Tinderbox as my digital bullet journal. 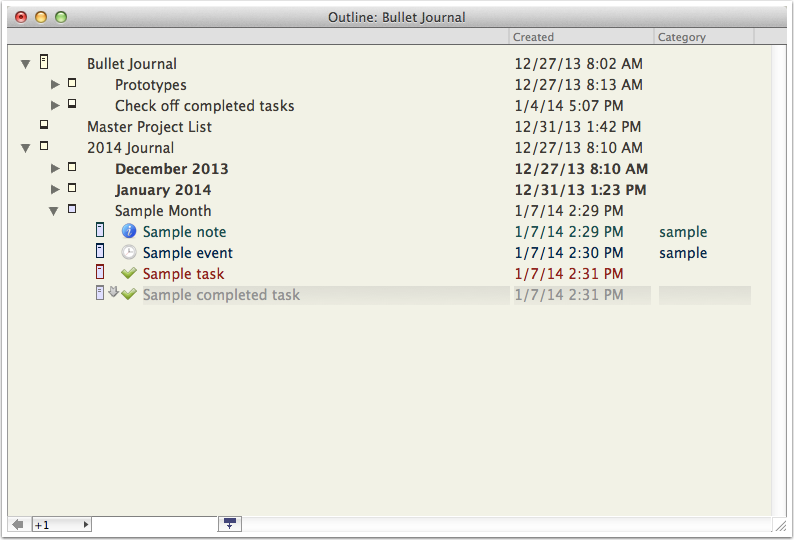 My digital bullet journal in Tinderbox (outline view). Bullet Journaling uses icons as visual indicators of the type of note. I can use simple icons in Tinderbox for this purpose, as you can see in the screen shot. I can set up prototypes in Tinderbox for each type of note (event, task, note are the standard bullet journal note types). This allows me to automatically assign the icon, a special color and some additional meta data to the information. I can append text notes to any note. I can use agents to help me gather notes, or change them (as I’ve done for completed tasks). Tinderbox adds the date automatically to the note, which I can show in the outline view, as above. Tinderbox’s outline view mimics the journal page in my notebook. 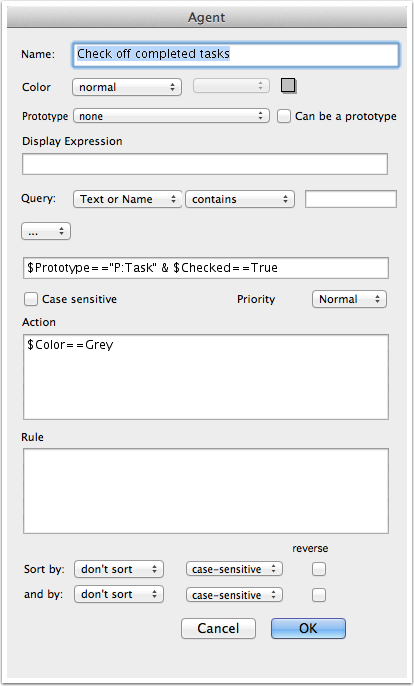 A Tinderbox agent that finds all notes that have a task prototype and are checked as complete. It then turns those notes from red to gray. As lower case “true” is really the proper form. Mark says (and my experience is that) it will work as is, but might be a tad quicker with the proper format. Thanks, Mark! No. I thought I might be able to make it work without real interaction with my iPad or my office Windows machine, but turns out that doesn’t work for me. I am planning year-end report on my bullet journaling experience.